Celebrating the recent release of their sixth album, Used Future, Austin stoner metal and hard rock outfit The Sword are set to return to town tonight, June 27 to headline Exit/In, where they’ve played almost annually for a number of years. One of the most dependable and talented American metal acts of the new millennium, the group’s excellent live show and prolific output make them a must-see, and with long-running Jersey stoner metal group The Atomic Bitchwax providing support this time around, this is looking like an especially promising pick for fans of old school heavy rock. Tickets are still available here, so grab yours now and read on for more about the show! 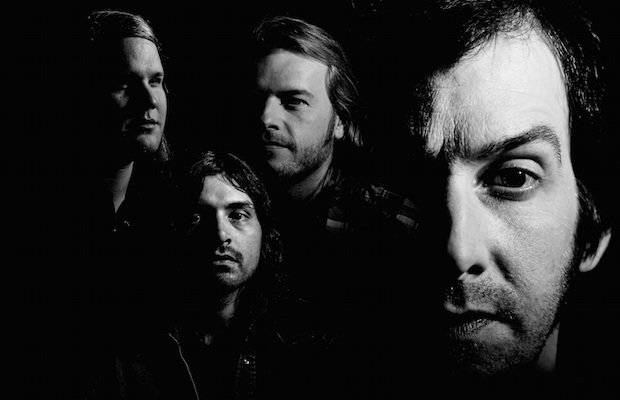 Formed 15 years ago in Austin, Texas, doom/stoner metal and hard rock outfit The Sword have become one of the most important and acclaimed American metal bands of the new millennium throughout their prolific run. Emerging at a time when metalcore and more trendy, polished acts were rising to prominence, the band took a decidedly more retro approach to their sound, drawing influence from classic acts like Black Sabbath, Metallica, Slayer, Iron Maiden, and Led Zepplin. 2006 debut Age of Winters brought them early acclaim, but it was 2008’s Gods of the Earth that helped the band break out at a more widespread level, graduating from buzzyworthy but niche early tours in the metal world, to opening for Metallica on the global stage. Over four full-lengths since, most recently this year’s Used Future, the group have continued to experiment with their sound, drifting more from doom and metal to more sludgey, stoner hard rock, sewn together by frontman J.D. Cronise’s literary, myth inspired lyrical prowess. Over the last decade, The Sword have toured with just about every major act in modern American metal, have played clubs and appeared at festivals across the globe, and have remained the subject of high critical praise. While their sound and presentation isn’t likely to attract a ton of crossover attention from those who don’t already like classic metal and hard rock, The Sword offer an excellent and admirable take on the genre, and they’re always an impressive and engaging live force. Tracing their origins back 25 years, New Jersey’s The Atomic Bitchwax should gel perfectly with fans of The Sword. Adopting a similar stoner metal derived sound, while also pulling from hard rock and psychedelic, the group began as a regional bar band, before finding early attention through their eponymous 1999 debut. In the near two decades since, they’ve released six more respectable full-lengths, most recently last year’s Force Field, and have amassed a cult following in the metal world, landing ongoing buzz, some high-profile placements, and countless live dates over the years. Perfectly primed to warm things up, and known for their high-energy, rock-fueled live shows, this is definitely a band you want to show up early for! The Sword and The Atomic Bitchwax will perform tonight, June 27 at Exit/In. The show is 18+, begins at 9 p.m. (doors at 8 p.m.), and tickets are available to purchase for $20-22.